What exactly does the Man in the Yellow Hat do? He lives in a 2-bedroom apartment overlooking Central Park AND has a house in the country -- that does not come cheap. Plus, he obviously takes trips to the Amazon, right?! That's where he found George. It turns out lots of people are curious about George's yellow clad friend. 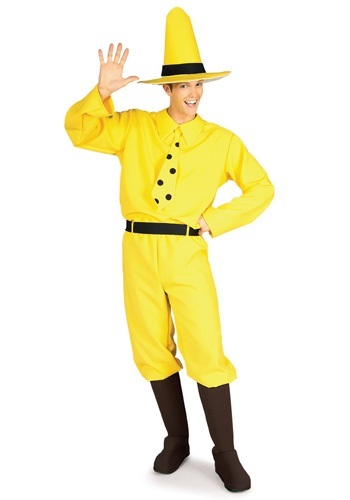 The search phrase 'what does the man in the yellow hat do' has over 7.5 million results. Google even autotypes it for you. Sadly, the answers are not as prevalent. If your first instinct is the say that he works at the museum, you'd be wrong. He has friends that work there and is frequently called in to help out on various projects. He is not employed by the museum, however. There are also some suggestions that he is a herpetologist, a person who studies amphibians, which would also explain his world travels. One would not expect that a guy that studies salamanders would have a salary large enough for a Manhattan apartment with a park view, though. In a television episode, the Man With the Yellow Hat wrote a book about Cerulean Warblers. Again, this is probably not on the NY Times Best Seller list, or is much of a money-maker. This leaves us with independently wealthy. Sort of Bruce Wayne meets Indiana Jones. Eccentric anthropologist who likes yellow hats meets monkey looking for a change.